JNN 17 July 2014 Abuja : A US citizen by the name of Jeremiah Heaton has claimed Bir Tawil, an unclaimed 800-square-mile patch of arid desert between Egypt and Sudan, as his own and declared it the “Kingdom of North Sudan”. 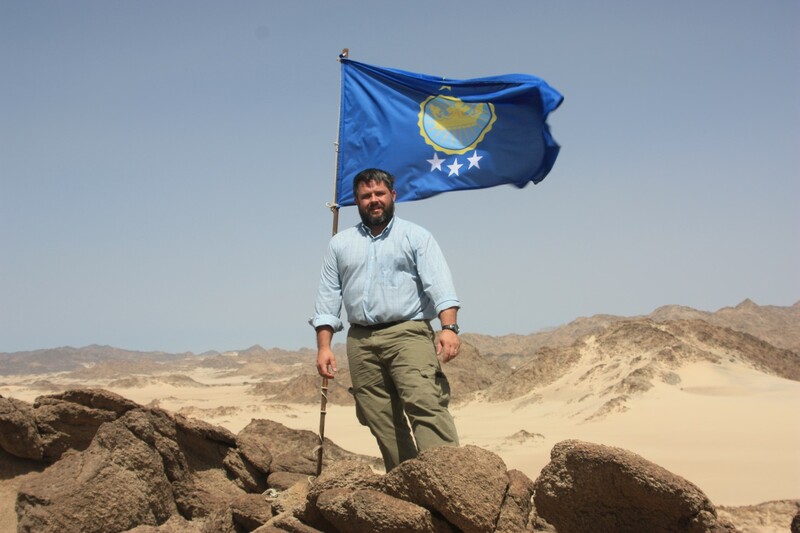 Heaton, who works in the mining industry, travelled to the territory where he erected a homemade blue flag with four stars and a crown on a rocky hill and vowed to seek recognition from Egypt, Sudan and the African Union. Asked why he went to such lengths, Heaton told Washington Post that he wanted to keep a promise to his seven-year-old daughter Emily that she would one day be a princess. He arrived at the location on June 16, on his daughter’s seventh birthday. “As a parent you sometimes go down paths you never thought you would,” he told the US daily. To actually establish his kingdom, Heaton would need legal recognition from neighboring countries, the United Nations or other groups, Sheila Carapico, a professor of political science and international studies at the University of Richmond, told the Bristol Herald Courier last week. Heaton argues that his claim is legitimate, pointing out that other countries, including what became the United States, were claimed the same way, except whereas those occasions were acts of war, his claim was an act of love. After establishing friendly relations with neighbors, Heaton said his next plan is to convert his “kingdom” into an agricultural production center. This entry was posted in AFRICA, United States and tagged Bir Tawil, Citizen, Egypt, Egypt and Sudan, Heaton, Jeremiah Heaton, North Sudan, Sudan, Unclaimed African Land, us, Washington Post. Bookmark the permalink.